Marta is a superb villa located in a privileged location in a quiet area of Cala d'Or but close to amenities that the resort offers. The sandy cove Cala Gran approx. 500m. 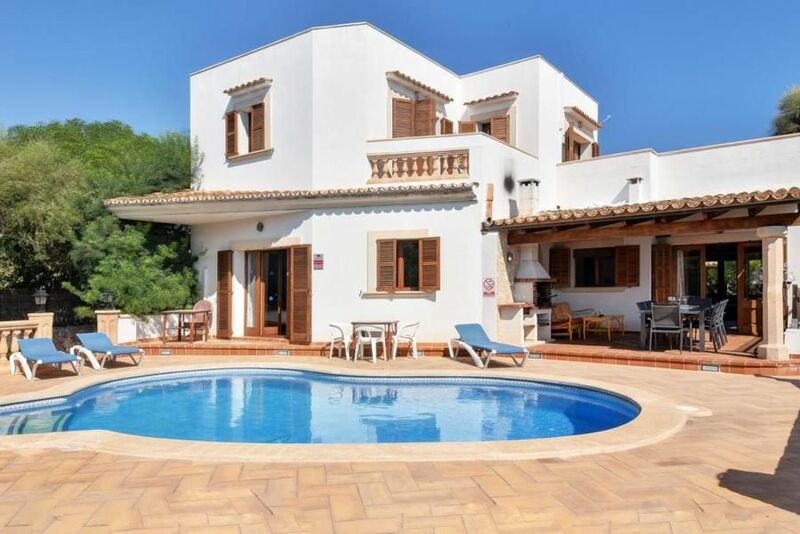 away and Cala d'Or centre are within 10 minutes walk. This bustling resort which heart is a pedestrian area is full of restaurants, cafeterias, bars with live music, shops and boutiques. Its charming marina with lovely water front restaurants were enjoy a nice meal looking at the yachts moored at the pier is only 5 minutes drive. The marina offers also the chance to make excursions with sailing boats or the glass bottom boat and visit the beautiful south coast of Majorca with its lovely sandy coves, charming fishing ports or even the natural Park of Mondrago. Nice covered terrace with built-in barbecue, table and chairs where enjoy al frescomeal or just relax overlooking the pool. The lovely kidney shaped pool (7m x 5m, depth 1,90 m) with roman steps is surrounded by aterrace with sun beds to sunbathe and an open poolside shower. The terrace is surrounded by bushes for private sunbathing. Lawned area at the front and sides of the house. - Visitor's tax: according to consumption (Mandatory). - Ecotax: per object and day according to consumption (Mandatory).